This is just the greatest thing ever. I really don’t have anything else to say about it. You should make this. That is all. I made this to top off a glorious Valentine’s Day meal at home with the man, he was pleased as always. It has every element you could ever want. Chocolate, butterscotch, vanilla bean, salt…just perfect. Budino is an Italian version of a pudding. Not as firm as a custard, but soft and creamy like a pudding. I have paired it in this with a thicker, firmer, chocolate custard and a cookie crumble at the bottom for a lil texture. Sprinkle with a little Maldon salt and some soft whipped cream and you are ready for your diabetic coma. The flavor of this is true butterscotch, it is not a caramel. 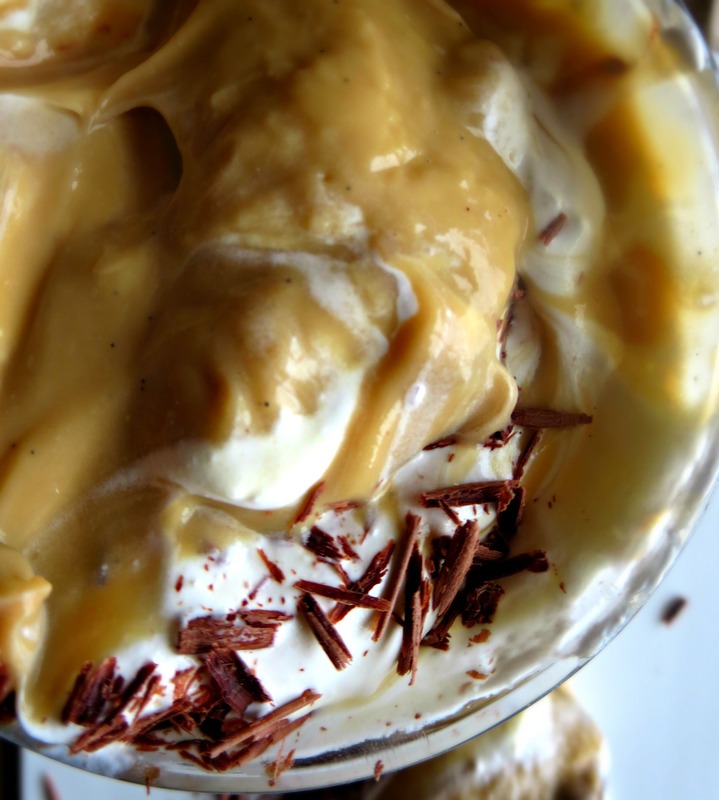 I am sure a caramel would work excellent here as well, but I think butterscotch is underplayed next to caramel, and this really put it front and center. It all just goes together…plus it looks so damn nice…get on this please. Mix melted butter and wafer cookies together. Press lightly, you are not making a firm crust like a cheesecake, into the bottom of four glasses or custard cups…whatever you are using as your serving pieces. In a small saucepan, combine the cream and sugar. Add the scraped vanilla bean seeds and the pod to the cream. Bring the mixture to just a simmer (don’t boil) and pull off the heat. While this is coming to a simmer, in a mixing bowl, whisk the egg yolks until frothy. Gently pour some (like maybe half) of the cream into the yolks, whisking constantly or you will end up with scramble eggs in your custard…super gross. Pour the egg mixture back into the pan and return to low heat. Cook, whisking or stirring constantly, until the mixture is thick and you can barely see bubbles coming up. Remove from the heat. Toss out the vanilla bean. Add the chocolate and whisk until melted and smooth. Pour chocolate custard on top of cookies, roughly one part chocolate two parts butterscotch. For this dish, the main element is the butterscotch, the chocolate is merely and accent, so less on the chocolate. This needs to cool and set up completely. Lucky for me, it is -20 in Chicago, so outside works for quick cooling. In a bowl, whisk 2/3 cup dark brown sugar, cornstarch, and salt. Set aside. In a medium-sized saucepan, heat the cream and milk until just steaming. Add the scraped vanilla bean seeds and the pod to the cream mixture as well. Stir the sugar mixture into the cream and continue mixing until sugar is dissolved. With medium heat, continue stirring until milk/cream is very hot, but not boiling. While milk/cream is heating, in a medium bowl, whisk together the egg yolks and 1 tablespoon dark brown sugar. Gently pour some (like maybe a third) of the hot cream/milk into the yolk. Again, whisk this constantly or you will end up with scrambled egg budino, I promise you. I did this before when I thought I knew everything and was lazy. Pour the tempered egg mixture back into the pan. Keep the heat on medium, stir continuously until super smooth and thickened and creamy. I looked for the first decent-sized bubble to pop up and then I took it off. Move the saucepan off the heat. Stir in the butter until melted, this will make for a rich and shiny pudding. Whisk in the vanilla extract. Finally pour this on to the cold chocolate and put in fridge to chill and set up completely. When it is time to serve sprinkle the butterscotch budino very lightly with your salt and top with the whipped cream and if you like and are feeling fancy, chocolate shavings.